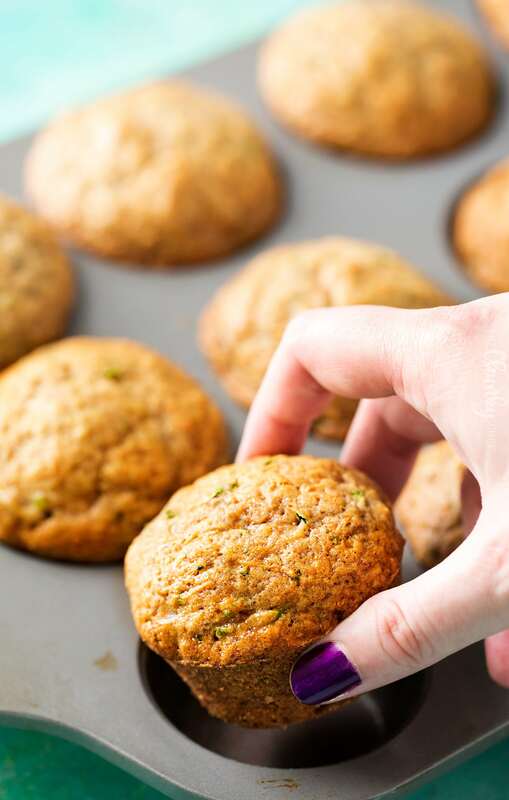 Once you try my easy one bowl zucchini muffins, you’ll be craving them year round! They’re tender, sweet with classic zucchini bread flavors, and perfect for getting little ones to eat extra veggies! 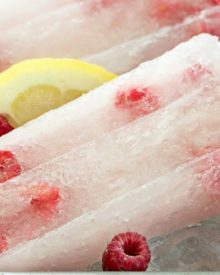 I love to use seasonal ingredients when I can, and the summer is RIPE with great fruits and veggies that are in season! Pun intended 😉 I was thinking about hitting up a local farmers market the other day, (to make this fantastic heirloom tomato bruschetta! ), and I remembered another great vegetable that’s perfect in the summer months… zucchini. Like most traditional muffins, you actually don’t want to use a mixer to make them, as if you beat the batter too much, it’ll make the muffins tough. 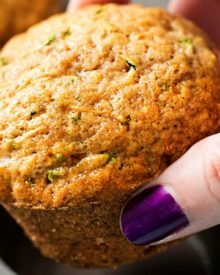 But I took it one step farther and all you need to make these zucchini muffins is one bowl, a box grater, muffin pan and a wooden spoon. Easy peasy! I like the way these muffins look without the paper liners, but you could absolutely use them if you prefer. I know, I know… I just said that I didn’t like to use liners lol. These little parchment cups are perfect for transporting the muffins, (not mention looking cute), and are great for photos. For those of you with young kids that turn their nose up at anything and everything vegetable-related… fear not. My veggie-hating daughter devoured two entire muffins and had no clue that they were chock full of the dreaded zucchini squash! Fun tip: the next time you’re making taco filling, add some grated zucchini to the meat mixture, then cover it with cheese. No one will know that you just added extra veggies and nutrients to their favorite meal. I do it all the time! You might be looking at those green bits of zucchini and thinking, “yeah… my kids are going to take one look, see green, and not eat them!”. No worries there, just peel the zucchini squash before you grate it, and it’ll blend in seamlessly!! I’ve done that plenty of times 🙂 Sometimes a Mom has to do whatever it takes to get her kids, (and sometimes husband) to eat their veggies right? 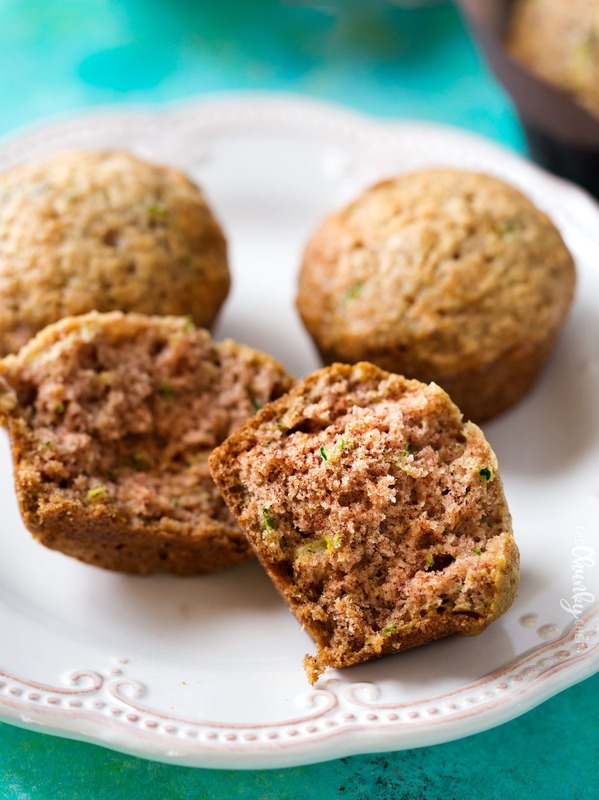 Take advantage of the fresh zucchini in season right now and make these one bowl zucchini muffins… you’ll love them!! Muffin pan – I’ve used these pans for years and I love the way they bake so evenly! Cookie scoop – This makes scooping batter SO easy! It holds about 1/4 cup of batter. Box grater – makes grating a breeze… perfect for veggies, cheese, butter, etc! 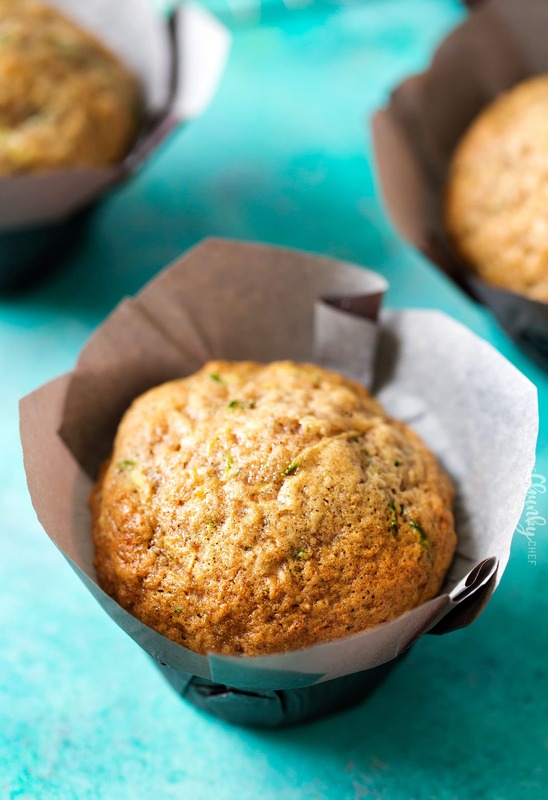 WANT TO TRY THESE ZUCCHINI MUFFINS? 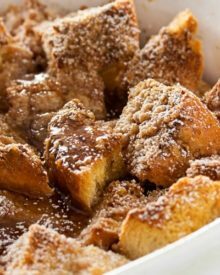 PIN THEM TO YOUR BREAKFAST OR MUFFINS BOARD TO SAVE FOR LATER! Scoop batter into prepared muffin pan, filling the cups almost to the top. Bake about 20-23 minutes, until golden brown and a toothpick inserted in the center comes out with only a few moist crumbs on it. Let muffins cool in the pan a few minutes, then remove them to a wire rack to continue cooling. These were absolutely delicious but mine came out a little dry. I did bake it in a mini cupcake pan but reduced the bake time. Any insight on how to make it more moist? These muffins are definitely dense, but shouldn’t be dry. I’d either try reducing the bake time by a minute or two, or adding a small drizzle of vegetable oil to the batter. Tried these absolutely delicious. You are right can’t stop with one. Thanks for sharing recipe. Don’t have vanilla flavoring used lemon and vanilla butternut they turned cnb out great. Will keep making them. Made these today & they’re so YUMMY. I added some shredded carrot and chopped walnuts, too. Will make again!! I love these! They look delicious and I can sneak in some veggies! 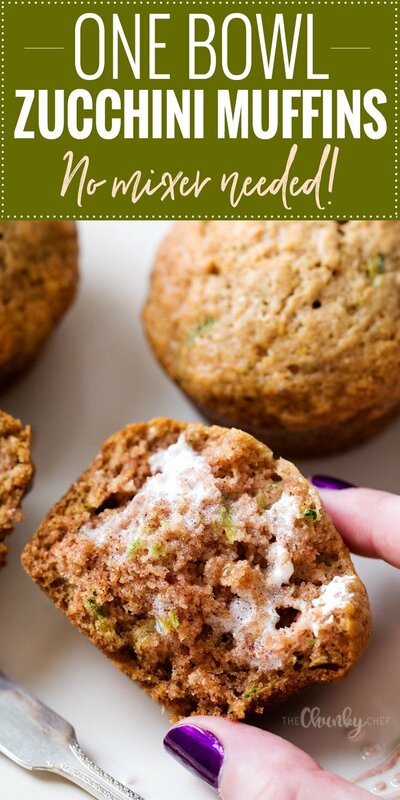 My kiddos lover zucchini muffins and these look so soft and delicious! I have to make these soon! These really are simple and perfect. Just right for a nice muffin breakfast! 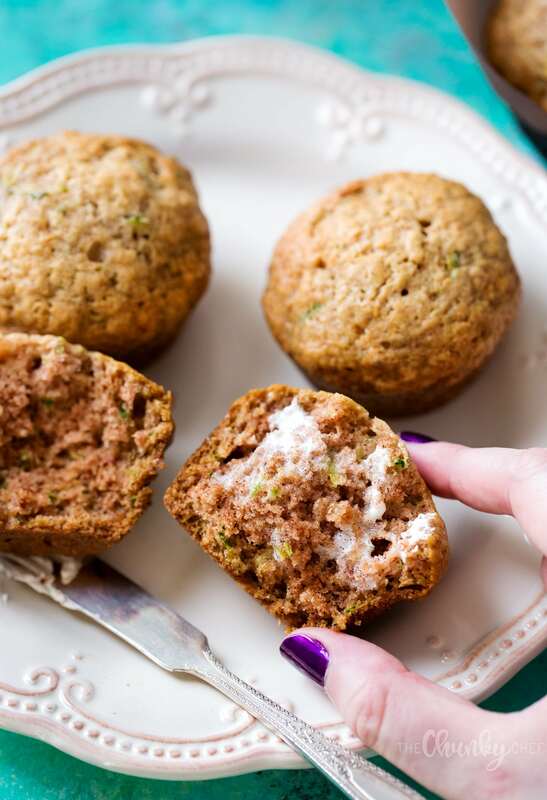 Moms always seem to have the best zucchini bread recipes — and these muffins look pretty amazing, too! I think cream cheese on these would be divine! I love putting zucchini into baked goods this time of year! 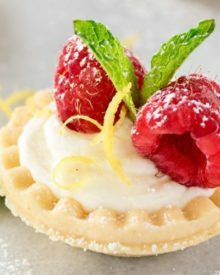 These are so perfect for our summer breakfast routine. We are up and out the door and portable breakfasts win….bonus that these are full of veggies too! Thanks! I’m all about sneaking in veggies every chance I get so I’ll definitely be using the peeling/blending more method. I don’t want to take any chances of the kids catching on, haha! I know they’ll gobble these up!